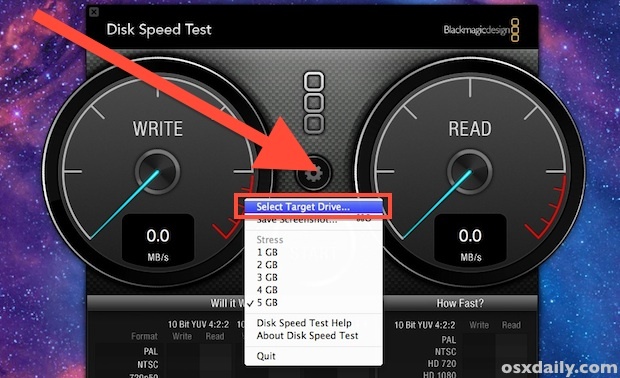 If you need to know the disk performance of an external drive, you can easily go about testing the read and write speed of any such drive by using several third party apps. We’ll cover two, the first is aptly named Disk Speed Test, and the second is called Xbench. Either will work to determine the read/write speeds of any drive, though we’re going to focus specifically on external devices, including USB flash thumb drives, standard USB external hard drives, a Thunderbolt based external disk, firewire, or even network volumes. This can be helpful for benchmarking the performance of external volumes for Time Machine backups, RAID setups, or even just to find out if an external USB flash key drive is fast enough to run a game or app from. For those who aren’t aware, external drives are generally much slower than internal drives, so for most cases you should not expect the performance of an internal disk to replicate on an external drive. The results from Disk Speed Test populate on the right side under the “How Fast” section, and show both the write and read speeds. If desired, you can adjust the size of the file being tested for read and write speeds by pulling down the “Stress” menu. Another option is to use Xbench, and older free app that performs a general benchmark suite on OS X. 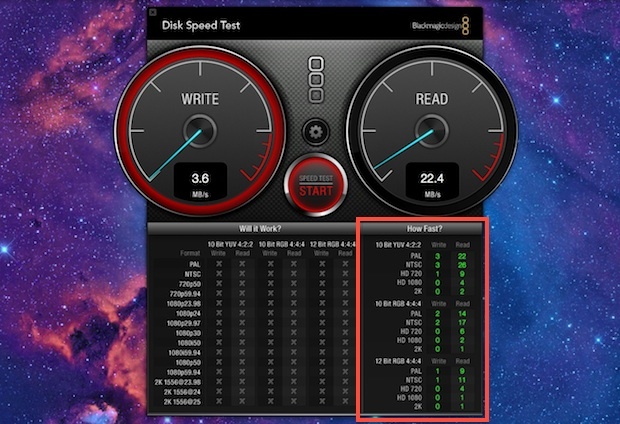 With some minor settings adjustments, XBench can be turned exclusively into a simple disk speed performance testing suite, and it provides a simpler interface than Disk Speed Test. 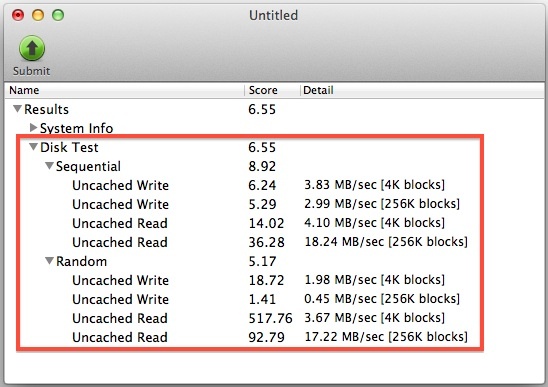 When Xbench is finished you will see the results under “Disk Tests” for sequential read and write and random read and write tests for different size file blocks. Many external devices may have slow read and write speeds that would be intolerable for primary disk performance, but for an external volume that speed may be considered acceptable since it’s usage is more limited. Remember, drive speeds vary greatly with external volumes, and some limitations come from the drive type itself (flash, ssd, traditional spinning platter), and others from the connection interface (USB, USB 2, Thunderbolt, etc).